As Spain braces for one of its most crucial elections in decades, Catalonia and its bid for independence is set to be one of the hottest issues of the campaign for the April 28 vote. Here are some key points to understand why. Why is there an election to begin with? After less than a year as president, the Socialist leader Pedro Sánchez called fresh polls after a deadlock in the negotiations with Catalan pro-independence parties to pass the general budget for this year. Yet, Sànchez could depend on the votes from Catalan and Basque groups to stay in office—the same parties that helped him oust Mariano Rajoy from power in June 2018, following a corruption scandal involving the conservative People’s Party (PP). 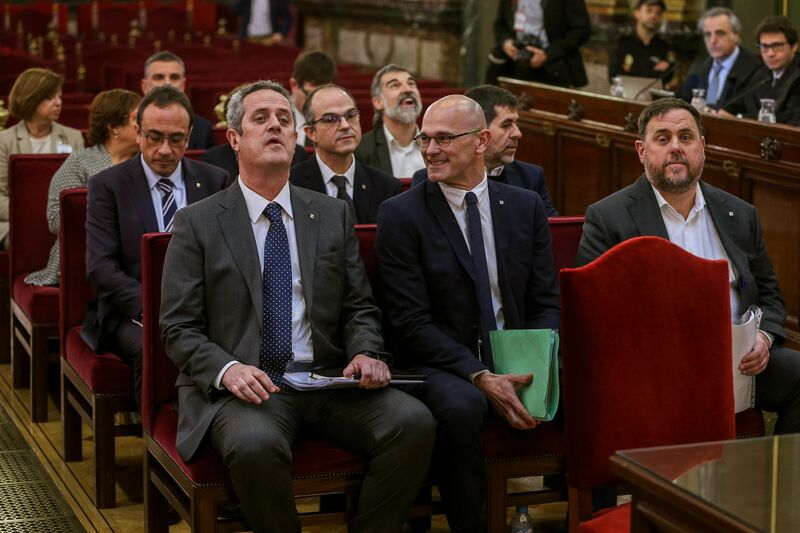 Discrepancies over Catalan self-determination brought the budget negotiations to a standstill, after the Socialists ruled out an agreed referendum on independence. Coincidentally, the budget bill was rejected in the Spanish Congress on February 13—just a day after the Catalan independence trial began in the Supreme Court. With the trial still underway, 12 politicians and activists—nine of whom have spent over a year in pre-trial jail—are in the dock for calling a referendum and proclaiming an independent republic in the fall of 2017, in what many see as Spain’s worst political crisis in decades. The general election will be the first time Spaniards head to the polls since the independence crisis. 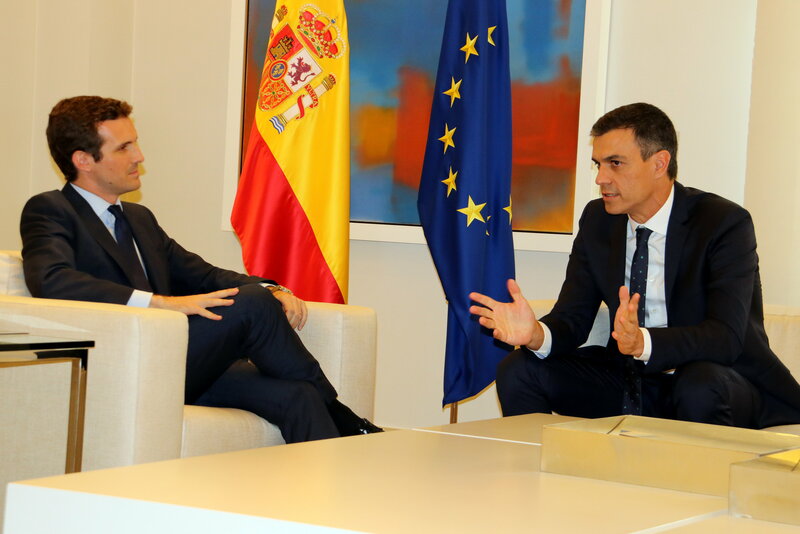 Back in 2017, Pedro Sánchez opposed the referendum and backed Rajoy to sack Catalonia’s then-president Carles Puigdemont and his government. Now, although distancing himself from right-wing parties that want to suspend Catalonia’s self-rule again, the Socialist leader continues to rule out a referendum. PP’s new leader, Pablo Casado, has pledged to impose direct rule on Catalonia again, and has said that this election is “all about Catalonia.” The unionist Ciutadans party (Cs) has also proposed Madrid taking over Catalan institutions, with Catalonia's opposition leader, Inés Arrimadas, even running in the election as the number two to Cs party leader Albert Rivera. Considering the alternative, the pro-independence parties might help Sánchez get re-elected if they win enough seats. But once the verdict of the independence trial comes out, this fragile alliance could go up in smoke again. A deadlock in the short or mid-term is likely if no way out of the Catalan crisis is found. Catalonia’s ruling pro-independence parties chose two jailed politicians as their top candidates in the Spanish general election, in a clear statement against what they see as an unfair trial. Former vice president Oriol Junqueras will lead the Esquerra Republicana (ERC) ticket, and polls predict he will become the most voted candidate in Catalonia. Activist-turned-politician Jordi Sànchez will head the candidacy of Junts per Catalunya, the party led by Puigdemont from exile in Belgium. In their umpteenth petition for release, Junqueras and Jordi Sànchez—as well as other pro-independence leaders running in the election—asked to be freed in order to take part in the election campaign. They also asked for election events to be allowed inside the penitentiaries where they are being held. The Supreme Court turned all petitions down. It’s unclear whether jailed pro-independence leaders will be allowed to take up their posts as MPs from prison. The election will also be marked by the rise of the Vox party. For the first time since Spain’s transition to democracy 40 years ago, a clear-cut far-right party could gain seats in Congress. Vox's proposed policies include deporting all undocumented immigrants, overturning laws combating violence against women, building an "impassable wall" on the border with Africa, suspending Catalonia's self-rule, and banning any party or organization defending independence. Last December, the election in Spain’s southern region of Andalusia saw Vox making a breakthrough into mainstream politics. Vox’s rise helped PP and Ciutadans form a government in the Socialists’ historic stronghold. Left-wing government, right-wing… or something in-between? In Spain, the era of the two-party system is over. The April 28 election will once again confirm what became clear during the 2015 hung parliament stalemate: neither the Socialists or PP will be able to form a government without support from other parties. The third and most improbable scenario would see Cs backing—or even joining—a Socialist-led government. Such a possibility has been repeatedly dismissed by Cs, whose voters prefer PP or even Vox over the Socialists. Yet, all possibilities remain open. Every time there’s a general election in Spain, all eyes are on the lower house of parliament and the number of MPs each party gains there. But as a result of the independence bid, the upper house—the Senate—will also get its share of attention this time. In comparison with the Congress of Deputies, the Senate’s political power is relatively modest; yet, in order for a Spanish government to trigger Article 155 of the Constitution and impose direct rule in Catalonia, a majority is needed there. Therefore, whether Catalonia’s self-rule is suspended again after the election will not only depend on who becomes the next president, but also who controls the Senate. Why is the Spanish general election crucial for Catalonia?